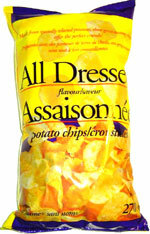 Taste test: The concept of the "All Dressed" chip is definitely a Canadian thing. Here in the USA, we just don't get it, and nobody knows what an All Dressed chip is supposed to taste like. Having just eaten quite a few chips from this bag, I can tell you that whatever they are, they taste quite good. The bag contains a ton of large, unbroken chips. They're thin but crunchy, and they have a great flavor combining a whole bunch of things — ketchup, onion, garlic, vinegar, mustard, and probably a whole lot more. It's really a nice flavor, and it grows on you. Excellent. Smell test: Sort of ketchupy, but with other spices too. 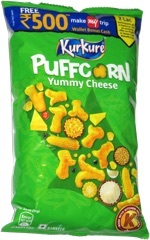 From the package: “Made from specially selected potatoes, these great-tasting chips offer the perfect crunch.” ... Ingredients include onion powder and garlic powder.